Light-colored items will be printed with dark letters. Dark-colored items will be printed with light letters. Personalized orders typically ship in 7-10 business days. Don't worry, our designers will perfectly center your initials! 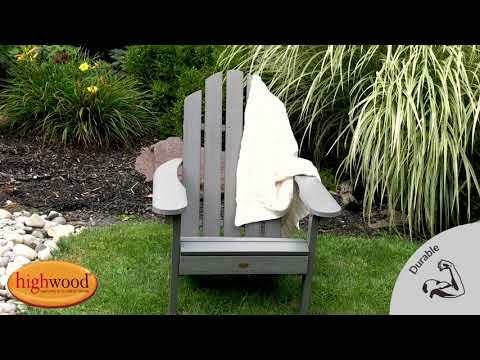 The Classic Westport Chair is part of the Adirondack Collection and is a stunning chair. To try it is to believe it. Considered by many to be the most comfortable of all flat backed Adirondack chairs it really does allow you to sink back and feel the stress release from your shoulders and back. This is a chair you will be comfortable in all day long and its traditional styling makes it perfect for your outdoor living area, whatever the location. The chair has been load-tested, per ASTM 1561-03 (2008) standard for Outdoor plastic furniture, and has a 500-pound weight capacity. Some assembly is required (see assembly guide). I have had my Highwood chairs for three years in the Arizona Desert Sun. They are just like new. This is a big, sturdy chair with wide arms that can hold a plate or drink. The flat back design is timeless and I find it very comfortable but my wife likes to use a pillow in her chair. It's easy to clean, too . The description says they can be power washed but we used a damp cloth and they looked brand new again. I expect this to last a long time. I ordered two of these chairs to use with my new fire pit. They are attractive, well-made, and very practical. Thank you! Just love this chair! Such easy assembly and directions! Great quality and very comfortable! Was going to purchase from a different company but product was made in China and got poor reviews regarding assembly. So glad I went with chair made in USA!! Assembly was a breeze!! Kudos to employees of this company!